This roman monument is situated at the bottom of wall that surrounds the Alcazaba and its origins date back to the 1st century before our era. The theatre was ordered to be built by the emperor Caesar Augustus in Malaca and was used till the 3rd century. The representations that were carried out in the theatre were of religious origin and promoted generally by the rich personalities of the city. The Malaga theatre also has an inscription dedicated to the founders or reformers. The theatre was abandoned by the subsequent civilisations and end up hidden underground until it was discovered in 1951 as from the building of some gardens of the house of culture which was located above, subsequently the house of culture was demolished to be able to continue with the archaeological excavations. 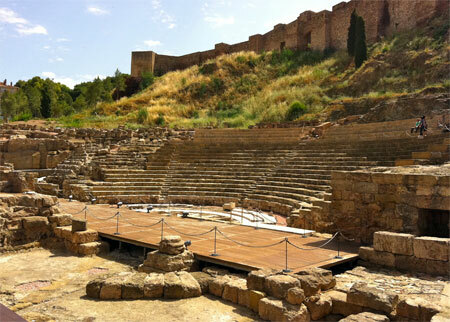 During the Arab reign in Malaca, they used material of the roman theatre for the construction of the Alcazaba. They also found an underground space used as a storage room related with the roman factory, this storage room was built during the 4th and 5th century and for its construction they had also used materials from the theatre. Little by little the theatre was gradually dismantled over the centuries, although luckily a great part of it survived till our days. Where the spectators sat, a semi-circular space divided by stairways. Semi-circular and situated between the stands and the stage, where the city’s authorities would stand. The place for the representations that had a wall as high as the stands that had an acoustic function. Currently, and after having been reformed completely, the theatre hosts theatre plays during the summer months...bringing back to life a space that has remained asleep since the 3rd century. Summer: From 09,30 to 13,30 and from 17,00 to 20,00. Winter: From 09,30 to 13,30 and from 16,00 to 19,00. Address: Calle Alcazabilla 8 - 29012, Malaga.